Though The Collaborator is Martin Donovan’s writing and directorial debut, he is no stranger to the game. Donovan has acted in both film and television for over two decades. His roles have ranged from co-staring in the 2009 horror film, A Haunting in Connecticut, to playing Mary-Louise Parker’s love interest in the popular Showtime television series, Weeds. Though Martin had plenty of acting experience in a number of different genres (as well in a T.V. show about a woman who sells pot), The Collaborator marks the first time an audience gets to see what he can do behind the camera. So what’s the verdict? The Collaborator may not be perfect, but thankfully, the guy can write. The plot seems simple enough, though like most everything else about this film, it is not quite that simple. The Collaborator is a hostage film, yes, but don’t expect any high-energy chase scenes or an abundance of machine guns and sniper rifles. In fact, the film hardly even touches on the danger of the situation. Sure, there’s a gun, some booze and a S.W.A.T. team involved, but by half way through, the viewer is pretty certain that no one’s getting hurt. That’s not what is at play in this film. 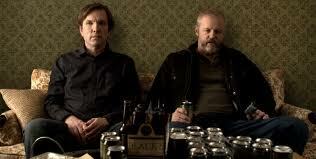 Instead, The Collaborator is about two men—two middle-aged, failing men—who are stuck in one house. Martin Donovan stars in his own film as the playwright Robert Longfellow, who is referred to in the preface of the movie as a writer who is “fading into irrelevancy.” The “writer of the film is portraying the writer in the film” dynamic helps undermine the traditional divide between cinematic fact and fiction right off the bat, a great trick, and one Donovan exploits repeatedly throughout the film). Donovan casts along with himself the equally talented co-star David Morse, and it’s a good thing too, because Morse’s performance helps sustain the film’s constant shifting between mental, emotional and physical states. Morse plays the character of Gus, a childhood neighbor who never moved out of his mother’s house. Gus’s invitation to Robert for a quick beer and game of catch-up quickly turns into a hostage situation that leaves Gus hiding out in Robert’s home with a few 6-packs, some weed and a gun. Morse nails this multi-layered character with veteran aplomb. As a result, he provides the perfect counterpoint to Donovan’s character. (It’s difficult to overstate the chemistry between the two actors and how it elevates The Collaborator’s muddying of what is real and what is on screen. A trip at times, The Collaborator is a play on a play on a play. The story ends with an abrupt death that itself seems destined, within the world of the movie, to serve as literary inspiration for the surviving protagonist. Overall, The Collaborator is the type of film that rewards repeated viewings. The movie’s shortcomings? A glacial paced coupled with rushed character histories and a love affair that does not quite achieve its dramatic aim. Nonetheless, the film is a noteworthy debut that showcases Donovan’s ability to write a screenplay that is securely moored in the realm of film theory and cinema history even as it entertains. So regardless of the film’s few hiccups and short-comings, the endeavor of making something like The Collaborator must be applauded. After all, many directors would run from the thought of an entire film based on two middle-aged men stuck in a house together. Donovan not only accepts this challenge, he embraces it.